Did not have this with stock height shocks, is this to be expected with leveled trucks? My camber is .5 degrees both sides, caster is 3.0 degrees and toe is .16 degrees and in spec. HELP if anyone knows what I am talking about and P.M. ME! Read that lifts give positive camber. On my 2nd gen truck at 2.56 lift with bills i MAY GO TO LOWEST SETTING TO SAVE MY TIRES! Chuck aka wacked is the alignment master. I left mine on the lowest setting but haven't driven enough to notice any tire wear issues yet. Was told by 4x4 shop to do frequent rotations, um yea. I rotate and balance every 5000 miles, the MICH AT/2 is a tire that should last but after last rotation outside wear more then inside not extreme but there. POS stock BRIDGESTONE WITH STOCK SHOCKS WORE OUT AT 24,000 miles, but were even wear across tire. With 5100 billsteins I may go to .85 lift to save 1000 dollar tires, looks good but!?! Evol did you only have the front aligned? Don't over-rotate - 5K should be fine. Something is up with your truck, period. I had the crappy Bridgestones on stock setup and even they lasted almost a full 40K. Just doesn't sound like it was aligned properly regardless of the numbers. Did you feel pulling, etc? And what are your driving conditions/habits? I thought you can't do 4 wheel on 4x2 truck like mine? The Bridgestones wore out evenly across, all 4 with 5000 mile rotations. Could have gone 8,000 more miles but one wet shimmy on hard down pour and that was it for those tires. The slight pulling is caster and a little negative to left side should fix that, no concern there. I don't take turns aggressively, cause if I did the Bridgestones would have shown outside wear as well. I had it aligned after shocks at alloutoffroad and again 3 times at NTB over last 8,000 miles. Weird thing is that the toe is fine after they are done aligning but slightly off of spec when checked again every 3-4,000 miles. camber and caster are always as before and in spec. GOT ME in a why did I mess with stock attitude, looks good though. At least you're happy with how it looks! You sound like you understand the terms well enough so I'm definitely more amateur than you would be. I'll keep you posted if I do have any issues later but I also wasn't pleased with NTB's work on getting my alignment correct after the lift. The spec sheet they gave me the 3rd time around is Greek but it's better than the first 2 tries. I have the problem with the outside tire wear too. Its not my driving habits, I don't know what it is. I worried and tried to fix it for a long time but it got so annoying I just forgot about it. My dad says its not "that bad". 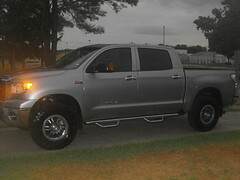 but that I had to expect it when I leveled my truck out and put aftermarket tires. He owns a car repair shop so I always take his word on things. I read at another site that level kits put more positive camber stress on tires/wheels. Translation means more outside tire wear. I asked allot of questions before putting on shocks to avoid this, but problem is there and will be obvious to most in about 7-9,000 miles even with tire rotations. 4X4 SHOPS WONT TELL YOU CAUSE ALL LIFTS DON'T DO THE SAME to all trucks, some worse then others. I am asking for help from guys who really know about this issue with just level kits or level shocks. My tires ARE OEM size for this vehicle. Still wondering about 4 wheel alignment on a 4x2 truck, there is nothing to adjust on rear of truck? On your lift you may not see it if it comes with UCA and reduce stresses to tires do to possibly complete lift, but keep an eye on it. Evol its not about adjusting anything on the rear. its about making the front line up with the rear. They put targets on all four wheels and then shoot a laser down the truck. this will tell them if all the wheels are aligned. oh, they just did front end alignment but rear tires wear evenly for sure. How is you tire wear on that monster truck and who aligned it? Evol, Shawn is right, a 4 wheel alignment is a must. What is does is make sure that the front end is going in the same direction as the rear end at the same angle, if it's off you may not feel it but the vehicle will "fight" itself trying to go straight and may cause strange tire wear. Caster should not cause tire wear because it is the relationship of the position of the upper and lower ball joint or whatever upper and lower pivot point on the suspension, think forks on a bike or motorcycle. If caster is too far out (positive or negative) it may cause issues with the other angles (camber) or even with toe in/out. I know you said the angles were all "within spec" but the thing is that when you lift or lower the suspension "spec" kinda goes out the window because you have changed the geometry that these specs were based on. Alignments can be tricky and for the most part you can go by the book on most mass produced vehicles but every now and then you get one that won't go by the rules. Not saying that the guys that did the alignment didn't do a good job but they should have offered a 4 wheel alignment and if the guys know what they are doing they should have a reason and a solution for your tire wear. Thanks for info SHAWN and WACKED, they all tell me at Alloutofroad in STAFFORD that they go by TOYOTA specs and same as NTB AND DON'T ADJUST in relation to rear. MY camber is .5 degree, caster is 3 and 3.3 degrees ( drifts a little to right cause of this), toe is .16 degrees. But that is front of course. Does ntb know how to do 4 wheel alignment. IF YOU LOOK AT TIRES YOU WONT Tell unless you get close, not like some other vehicles that it is obvious from far away. 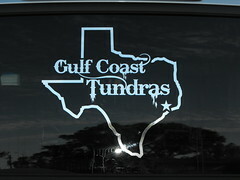 Where in Sugar Land or Houston can I align truck like that? They told me they can only put it in spec where it should be within the range of TOYOTA (WHICH IS ALL OVER THE PLACE). NTB did my 4 wheel. They were one of the only places that could do 37s. You just have to find a place that can do it right. Mine has been redone several times. But I have yet to find a place that I can say take your too. I HAD TALKED TO THEM for shock install in the past. May call them in future for alignment. see that in yours, if you are stock? And no way to grease them until aftermarkets come out, but don't want to change em unless they are worn. as well, CREWMAX, FULL LIFT ON 5100 AND STOCK BALL JOINTS. Maybe that is what lifts do to tires, even with a good alignment? LIFTED GUYS TELL ME WHAT TIRE WEAR YOU ARE SEEING? like I said earlier. I got a 3/1 spacer lift and I see the outside tire wear on my tires. Are your spacers steel or poly? I'm assuming your spacers are in good shape if they are poly. 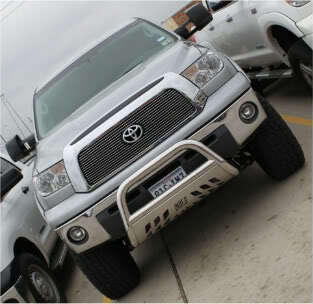 Check Tundra HQ they have a good article on leveling kits. Thinking I may want spacers in the rear so can someone go into a bit more detail on poly vs steel...pros/cons?